Value-added work is picking up at metal-service center Tampa Bay Steel. In the last year alone, the company has installed two new Haas CNC vertical mills, its third Trumpf laser-cutting machine, and its first waterjet-cutting machine. The new machines join five plasma-cutting tables and an oxyfuel-cutting table at the 200,000-sq.-ft. service center, which ships out an average of 300,000 lb./day of metal-alloy sheet, plate, structurals, tube and pipe. While most of the work coming out of Tampa Bay Steel is of carbon steel, the firm has carved a substantial niche supplying Type 904L stainless steel, which it ships all over the country—even taking in orders over the Internet. Applications for the high-nickel austenitic alloy, originally developed for its resistance to sulphuric acid, abound in the marine industry due to its ability to resist corrosion in warm sea water and other high-chloride environments. 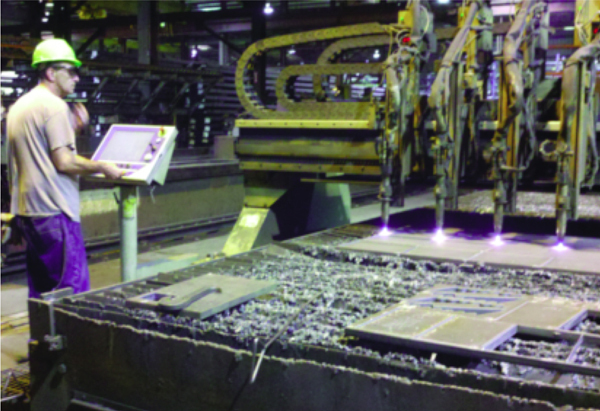 Prior to installing SigmaNest, if Tampa Bay Steel needed to laser-cut a part that originally had been programmed for plasma cutting, a programmer would have to reengineer the nest. That not only added time to the job, but meant that the firm had to store multiple cutting programs for the same part. Shown here is one of the firm’s three Trumpf laser-cutting machines; note the sheet nest displayed on the operator terminal. During an average day, Tampa Bay Steel fills some 200 separate orders, its 13 trucks making as many as 140 stops throughout Florida and South Georgia. Its diverse set of customers orders parts in quantities from one to 1000 or more, so managing material flow and sheet and plate utilization is a must. That task became exponentially more difficult as the company continued to add machines to its stable, to the point where engineering manager David Carpenter finally decided to seek a software solution that would allow him and his department of programmers to program every cutting machine from one piece of software. Early in 2011, Carpenter began to evaluate software options that would allow him and his team the ability, with one program, to nest and program every piece of cutting equipment in the shop, regardless of brand. 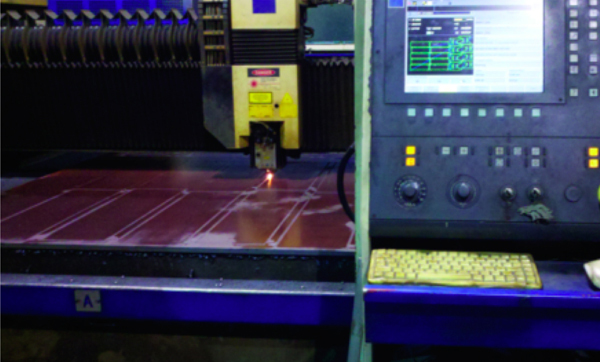 In mid-2011, Tampa Bay Steel installed SigmaNest CAD/CAM nesting software from SigmaTek Systems, Cincinnati, OH—three seats just for quoting and nesting, and four fully functional seats for quoting, nesting and for posting programs to the shop floor. In addition to enjoying the benefits of only having to learn and use one piece of software to program all of the company’s cutting machines, Carpenter also highlights how simple it is to import SolidWorks part files into his new nesting software. “While other software packages also offer this feature,” he says, “SigmaNest seems to do it better, with just a couple of clicks.” This feature proves particularly important when the shop decides to cut a part originally programmed to run on one type of machine (a plasma-cutting machine, for example) and, perhaps for scheduling or capacity reasons, decides to cut the part on another machine (say a laser). Carpenter explains. Carpenter particularly appreciates a new multi-torch optimization module introduced by SigmaTek early in 2011. The module, designed specifically for steel service centers or job shops using multi-torch machinery (such as the oxyfuel-cutting machine shown here working at Tampa Bay Steel), balances the conflicting desires of getting the most efficient use of material and fastest multi-torch machine cutting path, according to SigmaTek literature. Now, Carpenter can simply update the single SolidWorks file for a part, and when he brings it into SigmaNest he can automatically develop the optimum cutting program for the machine he expects to use for cutting. Each machine—laser, plasma, waterjet and oxyfuel—has its own set of variables contained within SigmaNest that affect how parts are to be nested, accounting for differences in kerf, cutting speed, and cornering parameters such as speed and acceleration. It’s also easier and quicker to perform dynamic nesting (combining parts for different orders onto one set of blanks) than before, says Carpenter, which boosts material utilization. The company can better track material flow through the shop, and provide operators more details about the jobs they’re to run, reducing the likelihood of errors. Carpenter also says that quoting accuracy has improved with the new software, by as much as 15 percent. In the past, estimators would program a job to run one , and down on the shop floor the operator might set the job up another—and perhaps less efficient—, resulting in a cost overrun. “Now we cut the job the it was quoted,” says Carpenter, “every time.” Improved quote accuracy means the company is improving the company’s win rate on new quotes, “and we’re internally more profitable,” adds Carpenter. SigmaTek recently issued V9.1 of SigmaNest, with several new features that Carpenter has begun to experiment with, including a feature for plasma cutting called iPierce designed to minimize the number of pierces required in a nest. iPierce creates an eyelet into the skeleton as it cuts the part, according to SigmaTek, then places the next lead-in in the eyelet area, eliminating the need for a pierce. Reducing pierces dramatically decreases the cycle time to cut a nest, especially when processing thick metal. Another benefit of pierce reduction is the elimination of slag where parts have been cut. Another feature Carpenter particularly appreciates is a new multi-torch optimization module introduced by SigmaTek early in 2011. The module, designed specifically for steel service centers or job shops using multi-torch machinery, “balances the conflicting desires of getting the most efficient use of material and fastest multi-torch machine cutting path,” says SigmaTek literature. After the number of torches has been selected to process a particular nest, SigmaNest automatically generates a nest to optimize cutting time and programming time. Last but not least, Carpenter appreciates how readily SigmaNest supports bevel cutting on the firm’s new waterjet-cutting machine (a Flow Mach 4). “Beveling on the waterjet, rather than having to use a milling machine, has brought several new customers to our door,” he says.